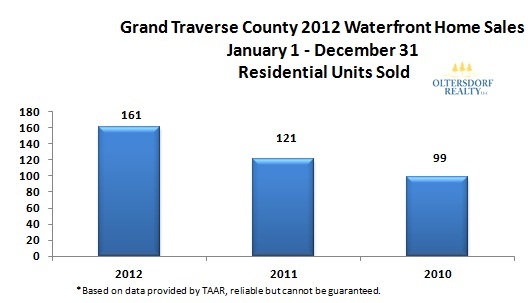 The 2012 waterfront sales data has been finalized as we begin to look forward to the 2013 selling year. How well did homes with private water frontage sell in Traverse City? The home sales statistics above compare waterfront real estate homes sold in Grand Traverse County from January 1, 2012 through December 31, 2012 to the same time period in 2011 and 2010. This includes the townships of Acme, Blair, East Bay, Fife Lake, Garfield, Grant, Green Lake, Long Lake, Mayfield, Paradise, Peninsula, Union, Whitewater, and the City of Traverse City. Waterfront home sales that were included in the data are any single family home with private direct frontage or private across the road frontage. Houses located on ponds, creeks, or with shared frontage were not included. 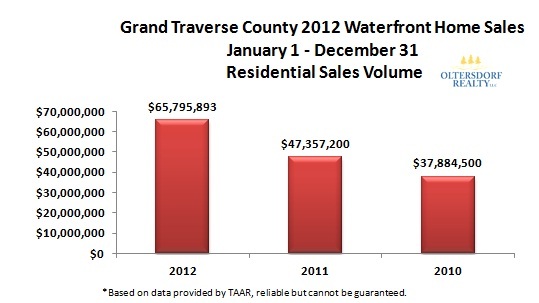 In 2012 Grand Traverse County experienced a 38% increase in waterfront home sales dollar volume and over 33% increase in total waterfront homes sold compared to the final 2011 numbers! Although these statistics show exceptional increases in real estate sales, Grand Traverse County still trails Leelanau County in the percentage of improvement over 2011.